The world's best selling line of bias-ply tires. Original Equipment fitments for thousands of applications. DOT and ECE certified. bias ply 6.70-15 Firestone tires. Note the pie crust edge around the tires. The wheel size is 15 X 6 inches. Worlds best selling line of vintage bias tires. Made in the original molds to maintain authenticity. Authentic Firestone lettering in the whitewalls. 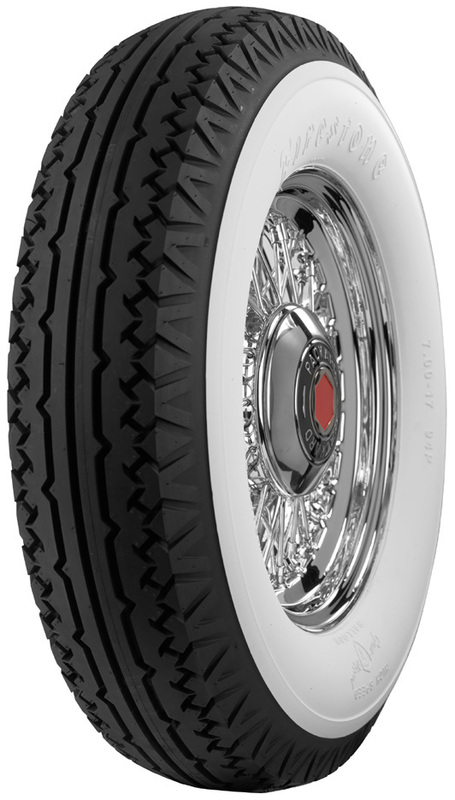 Actual whitewall tire, not added after the tire is made. US DOT and ECE approved where applicable. All 13 to 15" tires are tubeless. 16" tires and up require tubes. email or call us at 760-731-8303. Try our shopping cart or use your VISA, MasterCard, Discover or American Express credit card to make your purchases. PayPal also accepted. All prices shown on this page include shipping.